Rheinmetall Defence Australia announced that it will establish a Military Vehicle Cent of Excellence (MILVEHCOE) and an Australian HQ in Queensland if it wins Australia’s Land 400 combat reconnaissance vehicle program. The company, which is bidding for the supply of the armoured combat reconnaissance vehicle under the Commonwealth of Australia’s Land 400 Phase 2 program, plans to establish MILVEHCOE as a sovereign industrial capability for the continuous design, manufacture, export and support for military vehicles, turrets and tactical systems. Rheinmetall’s Head of Vehicle Systems Ben Hudson said the MILVEHCOE will be the focal point for the LAND 400 combat vehicles, LAND 121 logistics vehicles, and other complex defence projects and will include significant design, prototyping, manufacturing and system test capabilities, including a mobility test track, medium calibre firing range and an electro-magnetic compatibility test chamber. “Queensland is an outstanding location to establish the MILVEHCOE. The state offers a range of significant attributes including access to the Australian Army, industry partners, a skilled workforce and an excellent site to build a state of the art facility,” he said. The company, which is the largest supplier of military vehicles to the Australian Defence Force, collaborates with an existing network of number of Queensland-based companies (such as Nioa, Penske, Holmwood Highgate, Hilton, Harris Communications, Haulmark, ELBIT and LaserDyne Technologies) that support many of its current projects in Australia and overseas. Rheinmetall Defence Australia’s Chief Operating Office, Mr Gary Stewart, said the facility will also draw on this network to deliver products and services from local industry into Rheinmetall’s Global Supply Chain. “The performance of these companies gives Rheinmetall the confidence that Queensland industry has the quality and capability to locally design, manufacture and support military vehicles in Brisbane, Townsville and the regional training locations,” he stated. 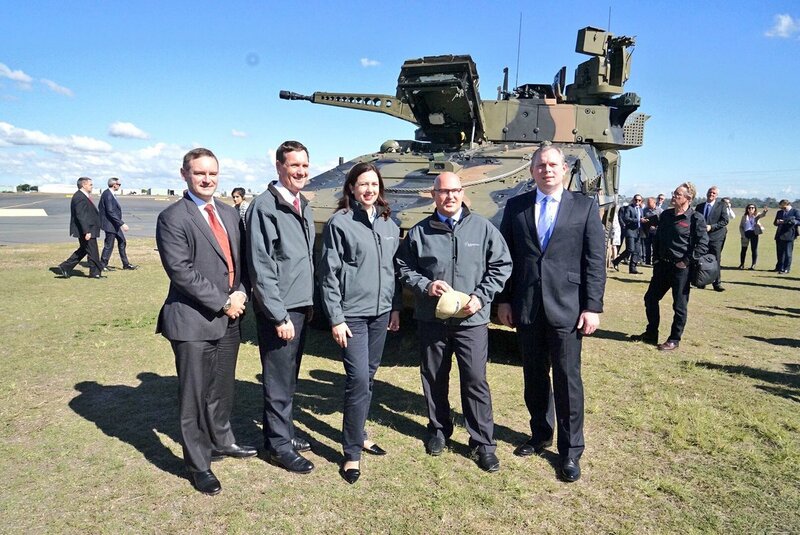 Image: Rheinmetall will build Land 400 in QLD if successful in winning Fed govt defence contract.